A workshop for South Asian dance makers to expand their practice of devising dance. More space available and chance to attend a part of the programme. Bharatanatyam practitioners only. Includes Choreolabs and In converstion event on 28 Sep. Afternoon Choreolabs: £35 per session. All five sessions for £125. All Indian Classical dance practitioners welcome. Participants can expect: morning Bharatanatyam masterclasses, live mridangam accompaniment, peer-to-peer practice, exchange sessions, concept development and personal creative time. Tickets: £5 (included as part of participation fee for the full intensive). Akademi presents a special opportunity for professional practitioners of classical Indian dance. This stimulating course will offer inspiring insights to help refine and develop your dance practice. With her unique and fresh approach to Bharatanatyam, Rama Vaidyanathan will inject, energy and enthusiasm to the creative process in this unique intensive held in London. Each morning Rama Vaidyanathan will lead a Bharatanatyam Masterclasses (exclusively for Bharatanatyam dancers) providing advanced training in technique and abhinaya. Increase your knowledge and practical understanding of the form through an exciting and highly challenging repertoire. Tailored to stimulate participants both physically and emotionally through an engaging and nurturing environment, this masterclass will visibly raise the quality of participants’ Bharatanatyam performance. In the afternoon Choreolab sessions (open to practitioners of other classical Indian dance styles), participants will deconstruct the creative process through the introduction and exploration of creation methods; encouraging debate, generating movement and structuring material. Each participant will have the opportunity to share devising techniques and add new ones to their creative toolbox, using the space for rapid generation of ideas or as a research platform and catalyst for budding work. Composition to Choreography is produced by Akademi with leading Bharatanatyam exponent Rama Vaidyanathan, in partnership with Watermans Arts Centre and Bharatiya Vidya Bhavan. “Bharatanatyam has thrived because of its detailed yet unconstrained system of communication. Through training we learn how to transmit stories and anecdotes from Indian mythology… however, is there more to Bharatanatyam than narrative? Can I use it as a convincing medium to explore, to question, to provoke and to celebrate? Can I use the movement dynamics of the dance form to reach out to the abstract? And most importantly, can I make this traditional dance form relevant to today, to now, without forsaking its core principles. Choreography is a limitless well filled with jewels, every day I plunge my hand into it and reveal startling things about the dance form that I didn’t know. I want to inspire practitioners, sharing these creative gems, I want them to understand these joys every single day of their dancing lives. Akademi welcomes applications from choreographers, directors and dancers for both the sessions. The last date for submission of application is Wednesday 5 September at 12 noon. The applications will be reviewed by a panel of experts and successful candidates will be informed by Friday 7 September 2018. 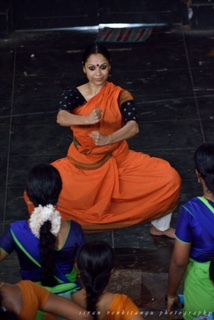 Participants attending the full programme are expected to have an advanced understanding of Bharatanatyam dance technique. These workshops are not suitable for beginners. Workshop/choreolab participants are expected to be professional or semi-professional practitioners, trained in a classical Indian dance form and have created three, or more, short choreographic works.